The companion photo from the one I posted yesterday. Both were taken by the same photographer (Jas. Wilkinson) and both appeared in The Bohemian magazine in 1900. It appears that both were probably taken from the top floor or roof of the Oriental Hotel at Commerce & Akard. The building about half-way up in this picture — the one on the right with the conical turret — is the Texas Land & Mortgage Company (seen here), located at Commerce and Field, placing the photographer at Commerce and Akard (the Oriental Hotel). So it seems likely that the photo from yesterday (seen here) was from the Oriental looking north up Akard. Photograph from The Bohemian magazine (1900) in the collection of the Fort Worth Public Library (which perforated the library’s name into the image). Paula: I think your identification of these photos is correct. 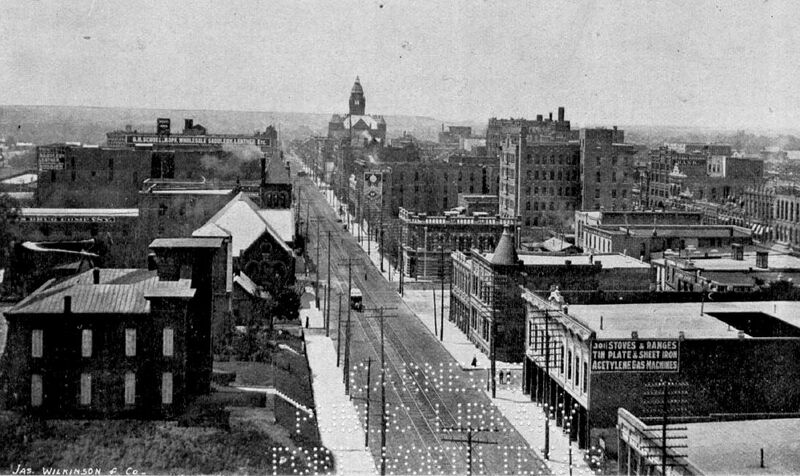 There is a companion to the “Commerce Street Looking West” in Henry Stark’s “Views in Texas, 1895-96” (Encino Press, 1974) which shows (in plate 20) Commerce “looking east from the Oriental Hotel.” Stark’s photo shows the 1400 and 1500 blocks (at a guess) of Commerce as looking downright seedy at that time. The Oriental clearly did wonders for the neighborhood. The Oriental Hotel was such a fixture back then — it’s kind of surprising it lasted for less than 30 years before it was torn down and replaced by the Baker Hotel. I love seeing the Oriental in photos because it helps me get my bearings since it’s one of the most identifiable buildings in Dallas in that era. What do the lights say at the bottom of the picture? Something about a public library but I can’t make out the rest.